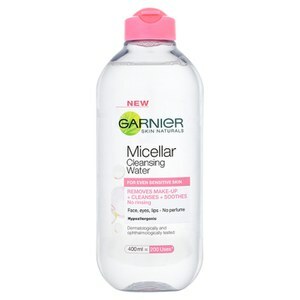 Refresh your complexion with Garnier Micellar Cleansing Water, a gentle cleanser that is suitable even for sensitive skin types. The formula utilises Micelles, which act as magnets to draw out dirt, bacteria and impurities from deep within pores without stripping the skin of vital moisture. The ultra-hydrating micellar water effortlessly banishes makeup without the need for rubbing or rinsing so you can experience soothed, clearer skin with no uncomfortable tightness. Perfume free. Hypoallergenic. Dermatologically and ophthalmologically tested. Apply the product to a cotton pad and wipe your face, eye area and lips. No rinsing required. Aqua / Water, Hexylene Glycol, Glycerin, Disodium Cocoamphodiacetate, Disodium EDTA, Poloxamer 184, Polyaminopropyl Biguanide, (B162919/4).